Get comfortable and close your eyes if you wish. Take deep breaths, in through your nose and out through your mouth. With each breath release all the tension that you have built up. Let your muscles relax. Continue your deep breathing and let all thoughts fall away, you are calm, and relaxed. Now see before you a sunny glorious day, you are in a meadow surrounded by a majestic forest. Near an oak tree and small lake you see a table made out of an old fallen tree. Scanning the meadow you see that others have arrived to the meadow, your coven sisters. Each of you are smiling dressed in festive pagan attire and carry full handmade woven baskets. You all reach the table and merry meet each other. It seems like it has been a while since you have seen one another, as your lives are so busy. You are very happy to be here with your sisters. Standing around the table you all hold hands. You give a prayer of thanks to the God and Goddess. You can hear sounds suddenly in the forest. You look to your sisters and smile. It is time for you to go. You take your basket and hurry to the edge of the forest. 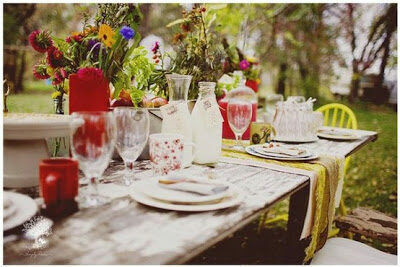 You take one last look at the laden table and just before you disappear into the forest, others begin to emerge. Continue to breath, in through your nose and out through your mouth. Slowly bring your awareness to the here and now. Wiggle your fingers and toes. Stretch, and when you are ready open your eyes.